Looking for pirates or dogs this weekend? Tampa Bay has got you covered. 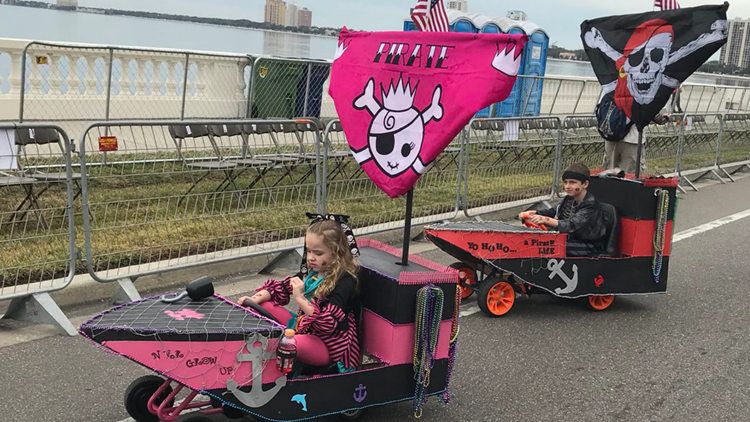 The littlest pirates celebrate Gasparilla on Saturday beginning with a bicycle and pedestrian safety rodeo, a preschooler’s stroll down Bayshore Boulevard and then the annual children’s parade. The Humane Society of Tampa Bay also has a krewe of dogs in the parade this year. The rodeo is 11 a.m. to 1 p.m., the stroll is at 1:30 p.m. and the children’s parade begins at 3:30 p.m. Here is a list of tips for parents bringing their kiddos to the Gasparilla Children's Parade. Beginning Saturday and running through Jan. 31, the Florida Aquarium will accept beads for recycling. Bring in 10 pounds of beads and get $10 off one general admission ticket. The program is in celebration of the Gasparilla season, which kicks off Saturday with the children’s parade in Tampa. Kids dressed in their pirate best get free admission with an accompanying adult. The aquarium is offering the deal Saturday for a place to take the kids before the downtown fireworks begin. The aquarium said the fireworks are best viewed from Bayshore Blvd. and the Tampa Convention Center. One of the biggest wedding expos of the year brings more than 100 vendors and exhibits to the Tampa Convention Center. Brides and grooms are able to sample wedding foods, check out gowns during a fashion show, enjoy celebratory cocktails and find ideas for their nuptials. General admission is $15 at the door. Want to watch dogs jump in the air and chase after Frisbees? Head to St. Petersburg this weekend. The competition is hosted by the Upper Suncoast Dog Training Club and has events like Frizgilit, ThrowNGo, 4-Way Play and Spaced Out. Day-of entries to play are $15 per game, but it’s free to watch. The comedian and host of The Daily Show returns to Tampa for a set at the Yuengling Center. Noah is also the best-selling author of Born A Crime. Tickets are $35-$85. A new production of the Tony Award-winning production plays at the Straz Center through Sunday. It’s set in 19th century France is based on the 1862 epic novel by Victor Hugo. Les Miz features iconic songs I Dreamed a Dream, On My Own, Stars, Bring Him Home and One Day More. Tickets start at $63. From 10 a.m. to 4 p.m. Saturday and Sunday, watch colorful kites fill the skies above Treasure Island and find spots to make your own kite and buy kites. You can also bring your own kite to the Thunderbird Beach Resort. The festival is free. Westfield Brandon’s LEGO store is hosting a grand opening celebration with a Master Builder who will create an 8-foot model of Emmet from The LEGO Movie 2. Kids and adults are invited to build sections of the model and to create their own LEGO frames to take home for free. The event runs 11 a.m. to 6 p.m. Friday and Saturday and noon to 6 p.m. Sunday. The model is expected to be completed around 4 p.m. Sunday. 459 Brandon Town Center, Brandon. The three-day festival features a rodeo, a 5K rodeo run, a motorcycle show, a horse show, a car show, live entertainment, vendors and educational exhibits. Its mission is to showcase Hernando County and the state’s best agriculture, wildlife, arts, talent and industry. General admission to the expo at the Brooksville-Tampa Bay Airport is $5. Children 5 and under are free.